Deputy Marshal McClain is found in his home, kneeling over his dead wife’s body, holding the bloody knife that had killed her. Accused of her murder, he escapes from jail and stumbles across evidence pointing to her killers. So begins a long manhunt that takes him from Arizona to the Texas Gulf Coast and a town on the shores of Laguna Madre. There tangling with the Skeltons, a family of bootleggers, brings McClain more startling information that sees him heading back to Arizona. Tormented by guilt, he at lasts meets his wife’s killer, and deals with him in a way he would never have expected. A tale that offers questions almost from the very first word that will sweep you up into the storyline with ease and keep you turning the pages as McClain tracks the Skeltons and the death toll mounts. Of course, you will have your own ideas as to who the killer is, but the author includes enough twists and turns to make you doubt your deductions. To say anymore about this aspect of the story would be a major spoiler so that’s all you’re getting from me about the killer’s identity. McClain makes for a likable hero, one who isn’t above making mistakes which lead to him suffering both mentally and physically. The conclusion is both hard-hitting and apt, leaving me feeling extremely satisfied with how the author decided to end this story. Will Keen is one of a number of pseudonyms used by John Paxton Sheriff, an author that I have read many times and one that I know will provide me with a very entertaining read. His expertly crafted plots, well-drawn characters, bloody violence and unforeseen surprises combine to make his books must reads. Each time I finish one I’m left looking forward to his next release, and that never comes fast enough for me. Meredith Fayett needed to marry someone before the week was out or she would lose her ranch. It sounded simple, so ranch hand Chance Stevens agreed to take on the job, in spite of his friend Marty’s warnings that it could only lead to trouble. But even Marty, a loyal though opinionated sidekick, couldn’t have predicted the mayhem that ensues when his own eccentric relatives appear on the scene, dragging Chance, Marty, and Meredith into the latest skirmish in a long running family feud. What follows is a hilarious tangle involving an emerald ring, a fearsome aunt, a scheming suitor, and a term of runaway mules – by the end of which Chance finds that even a marriage just on paper has its complications, and that it never hurts to have a good sidekick. Elisabeth Grace Foley takes the age-old plot of a young, pretty, girl about to lose her ranch to the bank, and comes up with a fresh, and extremely enjoyable, approach to resolving this problem. Elisabeth’s character studies are superbly portrayed and the story is beautifully told through Marty, and it’s his observations that offer most of the witty and laugh aloud moments that come thick and fast throughout this fun read. Marty’s extended family and their polite generational feud provide the complications to what should have been a straightforward solution to retaining the ranch and I don’t think any reader will be able to forget Aunt Bertha for a long time. There are also a number of surprises that offer some great plot twists that will have you wondering how the lead characters are going to solve them satisfactory. 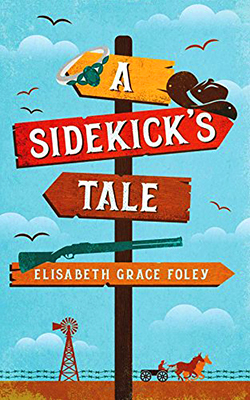 I’ve read a number of Elisabeth Grace Foley’s stories, and reviewed them on Western Fiction Review, and like those I found this one to be as thoroughly entertaining as any of them. In fact I’m even thinking it’s time I read her non-western books too. Kidnapped at sixteen, Maggie O’Bannen returns home after seven years to be reunited with her father. No longer the idealistic girl she once was, her return is meant to help put her demons to rest. Instead, it sets in motion a series of events that will put her on a collision course with trouble, and this time, Maggie has no qualms about speeding towards it. Discovering who was behind her abduction is just the beginning. Murder with no apparent motive and no suspect soon brings her under the scrutiny of the local sheriff. As the body count rises, Maggie fights for her life against a foe who will stop at nothing to win. As events escalate, Maggie will need to rely on her friends more then ever before if she is to survive. But at what cost? After the excellent first book I’ve been eagerly looking forward to the second entry into this series and the author has once again written a superb story that is, perhaps, even better than the pervious tale. I say perhaps because that will be down to individual taste as that opening story is a lot more graphic in its descriptions of violence and in this one it’s been toned down a little. Don’t get me wrong, that isn’t a criticism in any way, and there is certainly some very hard hitting bloody action to be found in this story, especially towards the end that will satisfy all readers who like this kind of content in their reading material. 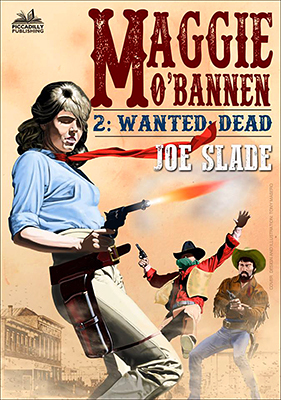 This time around Joe Slade includes a perfect blend of murder mystery into the story that never loses its western atmosphere and this very welcome element grabs hold of the reader urging you to keep turning the pages as you will want to discover who is poisoning Maggie’s father, and more importantly why. There are also numerous attempts on Maggie’s life and this brings forward additional questions of whether this is the same person who is slowly killing her father or is it someone else? All this makes for some gripping reading. Like in the first book, Maggie must suffer some brutality, and not all her friends will escape unscathed. The final confrontation makes for an exciting and satisfying conclusion to this very fast paced tale and, once again, leaves me impatiently waiting for the third book to be released. THE RIMROCKER – It was more than Shawn Starbuck had reckoned for. Unceasingly he had searched for his brother – a legacy at stake for them both – asking endless questions on numberless trails, in sun baked-towns, at desolate huts and sprawling ranches . . . and now it seemed, at long last, his search would end. Only it wasn’t that simple. Suddenly there were three desperate men on the scene – cutthroats and renegades – each staunchly determined to see Starbuck dead. If they couldn’t do the job, the richest man in the territory would hire gunslingers who could. Starbuck had a choice. He could turn tail, clear out, and save his hide. But he wasn’t the kind of man who dodged trouble – no matter what the odds. THE OUTLAWED – Starbuck had ridden endless miles over the trackless southwest on an unending quest for his brother. Now he was almost on the heels of the man who might be Ben. 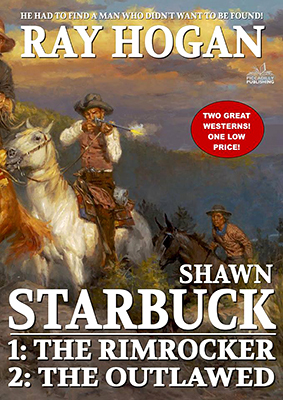 But deep in the wilds of Arizona, Starbuck stopped to aid a stranger against savage Apaches, a man on a mysterious mission of his own, a man who led Starbuck into a web of vengeance and bloody violence. 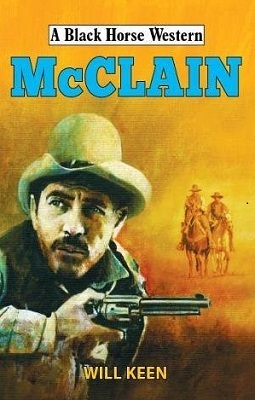 Piccadilly Publishing continue their own quest to bring back excellent westerns from the past so that those who may have missed them the first time around can discover new authors or heroes. This is the case for me. I have long been aware of Ray Hogan, and his twenty-four-book series published in the 1970’s featuring Shawn Starbuck, but have never got around to reading these books, or any others by this author. Packaging two books in each ebook edition at very attractive prices made it a perfect opportunity for me to try Ray Hogan’s work and I’m extremely glad I did. The first thing that struck me was how well these books, both originally published in 1970, stand up with those being published today. True, Starbuck may have a very obvious belief in the difference between right and wrong, whereas modern western writers often grey that area, but this was one of the things that appealed to me about Starbuck. The fact that he won’t back down until justice is served as he sees it should be is a strong and memorable trait of the character. As expected the first book tells of Starbuck’s past, of why he is hunting his brother. It also explains Starbuck’s ability of using his fists and this type of fighting features heavily in both these stories, as I imagine it will in the rest of the series. Both tales seem to be straight-forward in plot but then Hogan injects twists that took me by surprise and heightened my enjoyment of these well written and very readable books. It is rare for me to read two books by the same author one after the other, but on finishing The Rimrocker I just had to dive straight into The Outlawed and on finishing the second story I found myself wondering how it is I’ve only just discovered this terrific series and author and now I’m chomping at the bit waiting for the next two books to be published, and as it seems Piccadilly are hoping to put these double volumes out bi-monthly I haven’t got long to wait.